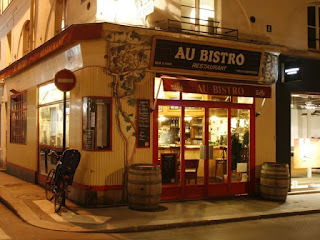 According to one story, the small restaurants known as ‘bistro’ acquired their name during the Russian occupation of Paris. The word became popular after 1815. In the bars and cafes, soldiers would demand quick service and shout a Russian a word that sounded like bistro. The term “bistro” became popular in America during the mid-20th century. Bistro is short for bistrouille, French name for a drink made of coffee and brandy. Bistrouille in turn derives from the French bis, meaning twice, and touiller, meaning to mix, the coffee first being mixed with milk and then with the brandy. Bistro was a place for working men and struggling artists in the late 19th century to gather. From these humble beginnings, all the various types of food and beverage facilities have developed, for quick, slick fast food eateries to elegant restaurant offering carefully prepare gourmet food in beautiful surroundings. Today a bistro can be anything from the dining establishments to an annex of a famous restaurant that wants to attract a wider range for diner.